On December 2, 2013, Harvard University Divinity School (HDS) convened a group of scholars, practitioners, and advocates to address “Religions and Peace: Do Universities Have a Role?” for a public panel followed by an in-depth evening discussion at HDS Dean David Hempton‘s residence with experts in religion, ethics, negotiations, and conflict resolution from across the Harvard community. Matthew Hodes, director of the United Nations Alliance of Civilizations, speaks at a Harvard Divinity School-sponsored event exploring how universities can help create interreligious dialogues, collaboration, and peacemaking. Participants on the panel included Martha Minow, Dean of Harvard Law School; Shaun Casey, Special Advisor to US Secretary of State John Kerry for faith-based initiatives; Matthew Hodes, Director of the United Nations Alliance of Civilizations; Jocelyn Cesari, Director of Harvard’s Islam and the West Program; and was moderated by Professor Diana Eck, Director of the Pluralism Project. Participants in the follow-up dialogue included J. Bryan Hehir of Harvard Kennedy School; Professor Ali Asani, Chair of the Department of Near Eastern Languages and Civilizations; and Dr. Jamil Mahuad, former President of Ecuador and Co-Director of Harvard’s Project on the Prevention of Global Violence. Global Security Institute President Jonathan Granoff presented a paper, “A United World or Divided World? Reflections and Policies for Human Unity,” which was an update of his presentation before the World Summit of Nobel Peace Laureates in Rome in 2004. At the Harvard gathering, Mr. Granoff served as a Special Representative of the United Religions Initiative, the world’s largest interfaith organization, where he serves on a Cooperation Circle, Voices of Conscience, along with Rev. William Swing, George Shultz, Dr. Sidney Drell, Bipartisan Security Group member Ambassador James Goodby, and GSI Board Members Ambassador Thomas Graham and Rev. Tyler Whig Stevenson, along with several other prominent advocates focused on the moral imperative to eliminate nuclear weapons. 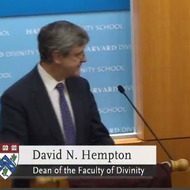 In his opening remarks, Dean Hempton made evident his passion for advancing practical ways of addressing the tragedy of religion-fueled violence. With a sensitivity to these tragedies resulting from having grown up in Northern Ireland, he convened these dynamic experts in a demonstration of his Dean Hempton’s sensitivity to the tragedy of religious inflamed violence arose from his direct experience in Northern Ireland and his passion for advancing practical ways of addressing this issue was evident in his opening remarks and the very fact of his convening such dynamic experts demonstrated his commitment to bringing sentiments for cooperation and peace into action. Mr. Hodes emphasized the critical importance in world affairs of intercultural and interreligious dialogue for bridge building. Law School Dean Minow, Dr. Eck, and Ms. Cesari all highlighted the interdisciplinary requirements for effective intercultural and interfaith dialogue, which include discussion, debate, collaboration, and listening. Mr. Granoff pointed out that the United Religions Initiative, which now engages millions of participants in interfaith dialogue and projects with a very grass roots- people oriented approach, began with the premise that such a process was needed and valuable. It began before the Internet made such dialogues vibrant and accessible. He said that Harvard’s example in this regard could influence educational institutions everywhere. He also emphasized that modern technology, particularly nuclear weapons, coupled with religious misunderstanding and exclusivism, is a lethal combination that must be prevented. His paper fleshed out these ideas into practical proposals. The events of 9/11 demonstrated both that low technology can be leveraged to cause tremendous injury and that the risks of tribalism, whether ethnic or religious, cannot be permitted to overtake the world. The situation takes on urgency for those who pay attention to the tons of nuclear materials in existence. Yet, we cannot throw up our hands and surrender the future to a world riddled with untenable risk, where identity politics could drive us into an abyss the horror of which Dante alone could describe. Can we expect unilateral militarism of one superpower to save us? Can we sit back and watch a slow descent into new fault lines of religious bigotry? Do we have any choice but to strengthen multilateral cooperation for security building based on the rule of law? A step toward that level of cooperation would be demonstrated if Russia and the US would take the lead in moving toward a world without nuclear weapons. While doing so, it is necessary to take extreme precautions to ensure that nuclear materials are not available to terrorists or other malicious non state actors and to prevent any further proliferation beyond the nine countries that already possess nuclear weapons. These are matters that must be addressed at the highest levels of state. But, the passions that drive ethnic and religious violence must be addressed at a community level. Changing hearts and building a culture of peace cannot be accomplished by the application of technology nor by diplomacy and the stroke of a pen. It is far too subtle and subjective. We can and must establish institutional structures to systematically address prejudice and hatred and build a culture of peace. We must demonstrate at a public level that interfaith understanding is to be promoted. Such centers at universities, using existing multidisciplinary resources, could host relevant courses, conferences, presentations, and focused interfaith and interethnic dialogue. These would soon be identified as venues for conflict prevention and resolution, places for both study and practice at the great universities around the world, and where possible, would sponsor programs in cooperation with the United Nations. However, establishing such centers should be done independently of the UN as such work has intrinsic educational value of the highest order. It will enhance relevant pedagogue, inspire students, and contribute to a safer world. The cost of creating university centers would be very low relative to the conflict prevention value and the prestige for the participating institution. Such centers could help create a critical mass of educated people who are committed to greater levels of interfaith and intercultural understanding and who are able to help ensure a global norm of tolerance and an appreciation for the value of pluralism. These Centers would be obvious partners with the ongoing efforts of the Alliance of Civilization as well as with the UN Academic Impact program, which is designed to coordinate efforts of the academic world with the UN agenda. In addition to their own ongoing efforts to inspire students in ethno-religious understanding, these Centers could help educate students and the general public about related programs of the UN and thus help create a constituency that can see beyond mere national interests. The knowledge and skills available in such Centers are exactly what is needed for the discipline of preventive diplomacy, which aims to prevent disputes from arising between parties, to stopping existing disputes from escalating into violence, and to limit the spread of conflict. Governments alone cannot accomplish this. In fact, religious institutions, academic institutions, non-governmental organizations, businesses and professional communities all need to see the value of greater levels of intercultural and interfaith understanding. They need to participate and feel a sense of responsibility to help accomplish goals of peaceful coexistence. A Center for Conflict Prevention and Resolution as part of the UN headquarters could utilize all available means of mediation, negotiation, conciliation, and nonviolent conflict prevention and resolution in addressing current and potential conflicts. The Center would utilize fully the good will of many of the world’s religious leaders as well as academic institutions which hopefully will become places where ethno-religious literacy and understanding will increase and provide relevant scholarship and inspire and train people with professional skills relevant to conflict prevention and resolution. To utilize the great religious traditions of the world as a resource for promoting transnational ethical values. Thus we recommend an ongoing forum where religious leaders can dialogically address the pressing need to establish common values and serve as a resource to advise the Secretariat and the Member States.To explore the promulgation of programs which teach tolerance, cultural appreciation and harmony at a profound level by creating forums for authentic inter-religious dialogue and the experiential sharing of the different methods of prayer, contemplation and meditation. We suggest the promotion in UNITAR and amongst UN personnel and the personnel of all national missions to the UN of retreat seminars focused on prayer and meditation in each of the world’s major religions. The resulting shared understanding represents preventive diplomacy at the deepest level, for when there is authentic spiritual sharing, trust and confidence are easier to accomplish. Also, the UN community will begin to actually be a model of intercultural respect and tolerance to which the Member States can look for guidance.To provide experiential courses on each of the religions’ prayer and meditation methods. Each of the world’s religions utilizes prayer and contemplation to help achieve inner peace and harmony. Such experiences lead people to a greater ability to perform inspired public service. We thus encourage the use of such methods be made explicitly available to all in the UN community in the form of offerings of on-going regular events designed to enrich multi- religious, ethnic and cultural development and understanding and for the enrichment of the personnel such that greater inspiration in documents and programs might be forthcoming from the UN.To engage religious communities in service to the suffering. Charity, service and compassion are universally-recognized values in all religions and areas of social development that can be more fully utilized by the UN. Religious communities, as a world resource, have been underutilized in this regard, and could help in coordination of resource distribution.To create a true vocation of service at the heart of UN work, forums need to be created in which shared spiritual and moral values and experiences can be expressed by UN personnel to one another. The UN Center for Conflict Prevention and Resolution will reinforce the many academic and local and regional efforts at which ongoing multi-cultural, interreligious, and inter-ethnic dialogue is taking place already. It could take full advantage of the world’s religions and could, in this context, be utilized to preempt cycles of misunderstanding, fear and violence. The extraordinary waste of resources on armaments and the suffering caused by their uses simply cannot be overlooked when addressing poverty. As long as resources are disproportionately diverted to pursuing peace and stability through military means and fortunes expended on weapons, ending poverty will remain beyond reach. The costs of an effort such as this one would be minuscule compared to military expenditures. By finding ways of promoting openly the process of interfaith appreciation, the quiet study of our common humanity is stimulated. One of the greatest gifts received by the openhearted is the gratitude of being part of the human family — a sense of joy in its variety of expressions of awe, love, and the sacred. Those who have this sense of gratitude are the ones who can step forward to assert our common ground, the place where exclusivism and fanaticism cannot flourish. Where our common humanity is affirmed and love expressed, fear, the breeding ground for fanaticism, is overcome. Where our common humanity is affirmed, the precondition for justice is established. Justice is the foundation for peace. 9/11 has shown us that a fractured world where fanaticism is allowed to grow, where grievances find no peaceful means of redress, where people demonize innocents who do not believe as they do, could, if it grows, be catastrophic. Where compassion informs action, hope results. Where justice and peace are pursued, hate, hopelessness and fear are dispelled. Let us be guided by our highest values and wisdom and create more places where our capacities for great achievements are affirmed. Whether garbed in extremist political ideology, racial of tribal identity, or religious dogma, the exclusivist’s vision diminishes our common capacity to work cooperatively, reason together, identify our common interests and establish rules and laws of governance. The successes of the modern world have demonstrated that Hobbes, who believed life to be short, brutish and nasty, was trumped by Locke and his philosophical stepson Jefferson, who viewed our fate with the faith that we are blessed with inalienable rights, regardless of our religious beliefs, that no state can remove and that we are capable of establishing institutions to protect those rights. This optimistic view is the basis of the United States, the Universal Declaration of Human Rights, and the UN System. It challenges all fanatics who deny civilized give and take. A first step to discover that all people possess such human capacities is through direct interfaith and interethnic interaction. We no longer have the luxury of living in religious ghettos. We must come into the open space of our greater humanity and assert the highest ideals that the founders of every faith proclaimed: “Love thy neighbor as thyself.” Our humanity is revealed the deeper we realize and live this admonition.